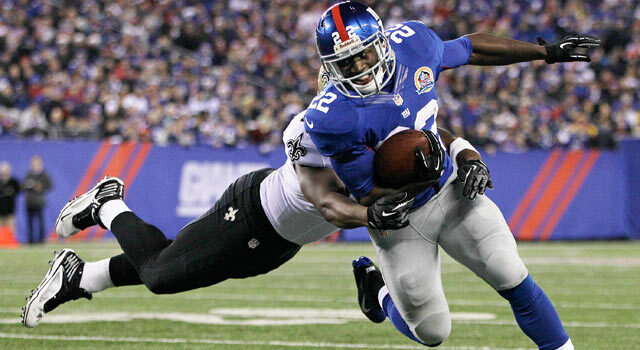 David Wilson is the name and story that scares away coaches and general managers. Wilson was a first-round pick (number 32) by the New York Giants out of Virginia Tech in 2012. He impressed as a kick returner and running back in his first year, gaining 1,888 all-purpose yards in 16 games. Wilson was named the starting running back for the Giants heading into the 2013 season, but in the fifth game of the year, suffered a neck injury that would eventually lead to him retiring from football. Running backs take a lot of abuse, and their careers tend to be shorter than most other football position players. That is likely why teams, at least for a couple of years, were shying away from drafting them in the first round. David Wilson in better days. The 2015 NFL draft saw two running backs selected in round one: St. Louis snapped up Georgia’s Todd Gurley with the tenth pick, and the San Diego Chargers took Wisconsin’s Melvin Gordon five selections later. While Gurley remained sidelined on Sunday, Gordon, as well as some later selections, had big-time impressive games. The Chargers’ rookie Gordon looks ready to take over primary running back duty, rushing for 88 yards on 16 carries against the Bengals on Sunday. While veteran Danny Woodhead will still receive a lot of touches, especially on pass plays, it won’t be long before Gordon is the standout and lead back. In Washington, rookie runner Matt Jones had an eye-popping 123 rush yards and two touchdowns on just 19 carries, an astounding 6.47 yards per carry. While that average won’t last, and the strong and powerful Alfred Morris still wears a Washington jersey and is ahead of Jones on the depth chart, the rookie should be seeing around 15-20 touches per week moving forward. With starter Andre Ellington down, Arizona’s rookie David Johnson stated his case for more touches with a 108-yard kick return touchdown, to go with a rushing touchdown later in the game. One Cardinals beat writer already predicts that Johnson and veteran Chris Johnson will be at near-equal touches next week, and Johnson should remain an important part of the offensive picture, even when Ellington returns to the field. Finally, Jacksonville’s T.J. Yeldon carved through the supposedly-improved Miami Dolphins run defense, seeing 25 carries for 70 yards. While the average is not that impressive, Yeldon earned some huge first-downs late in the game to set up the game-winning field goal for the Jaguars. He appears to be top-dog in Jacksonville already, ahead of veterans Toby Gerhart and Bernard Pierce. Several other rookies had small relief appearances for their teams, but the bigger picture appears that more and more running backs are entering the league and ready to become important contributors instantly. Big colleges are producing NFL-ready offensive players in huge numbers, with upgraded fitness programs and, uh, medicines, these 22-year-olds are entering the league bigger, faster, and stronger than ever. While David Wilson has moved on from his NFL career to pursue athletics, the crop of running backs from this past year’s draft seem poised to take over the gridiron quickly and with authority. 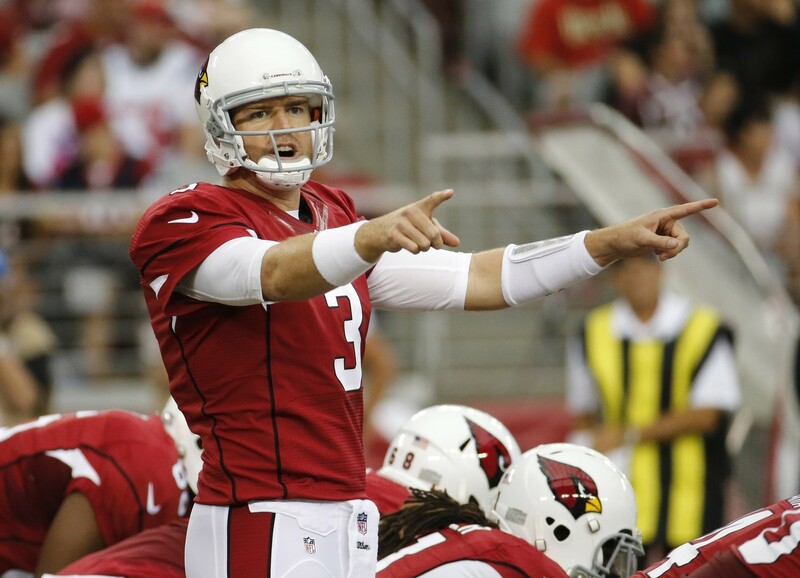 Carson Palmer wants YOU to pay attention. Where has the defense gone? Week 2 saw astronomically high scores in several games, like Pittsburgh dropping 43 on the once-formidable 49ers, Arizona putting up 48 against Chicago, and New England dropping 40 on Rex Ryan’s revamped Bills. Defense usually takes the longest to settle back into rhythm early in the season, so it’s tough to read too much into this at this point, but as the league continues to move towards pass-friendly rules in the Goodell era, it may start to become more and more common to see scores in the 30’s and 40’s, and far fewer in the single digits and teens. More on the extra-point/two-point convert selections. The Steelers went for a two-point convert on their first touchdown, and another later in the first half, and succeeded on both, in the process establishing themselves as the first team to use the two-point as their go-to post-touchdown scoring play. While they did settle back into extra-point kicks with the game wrapped up, their kicker Josh Scobee has looked shaky and they moved the ball so well that it was an easy decision to go for two. Look for more teams to follow the Steelers’ lead and use the two-point convert early and often as the season progresses. Larry Fitzgerald turned back the clock on Sunday afternoon with 8 catches on 9 targets for 112 yards and 3 touchdowns. With the score tied at 14, quarterback Carson Palmer hit Fitzgerald on a quick slant into the end zone for his first score. He blew past a pushed-up secondary on a flea flicker for his second, and just bullied cornerback Terrance Mitchell on a screen pass for his third. After years of playing with barely-pro quarterbacks, Fitzgerald looks pumped to have Palmer back under center. He may be on the wrong side of 30, but Fitz still looks like he has a lot left in the tank. Consider, though, the curious cases of Peyton Manning and Carson Palmer. Speaking of turning back the clock, Palmer, in both weeks, has looked like a Pro Bowl quarterback. So far this season he has displayed accuracy, arm strength, and excellent decision making, in leading his Cardinals to a 2-0 record. At the age of 35, Palmer has been displaying the skills not seen since his mid-2000’s seasons with the Cincinnati Bengals. 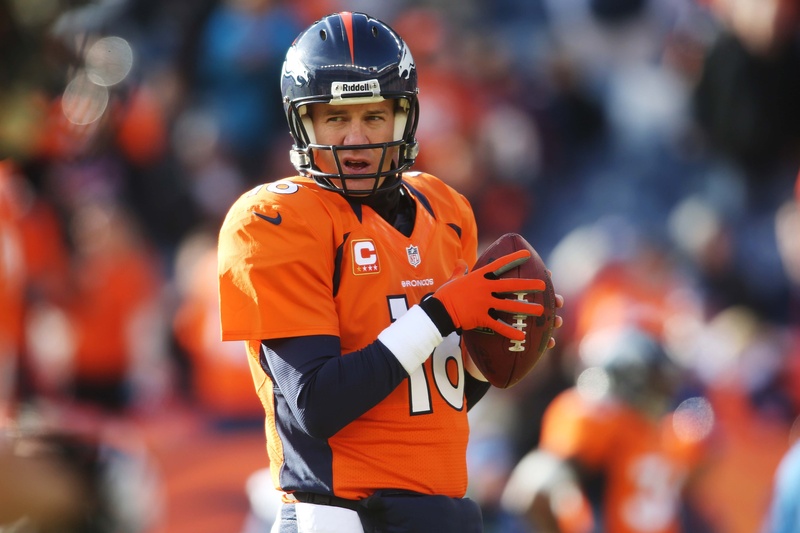 As for Manning, he started the first game-and-a-half of this season atrociously awful. His arm strength and accuracy are largely gone, and we already know he can’t feel his fingers, making grip for tight spirals an issue. But somehow, he keeps finding a way to get the job done. Mostly on the strength of a good offensive line and playmakers, and an unrivalled sense of anticipation and understanding of opposing defenses. Manning might not be the quarterback he once was, but he has found a way to put his available strengths to their best use. It will be a shame when he does decide to retire, but it is not out of the question that he puts in a John Elway-like final season. Peyton Manning stares down father time. Quarterbacks down! Tony Romo, Jay Cutler, Matthew Stafford, and Drew Brees all appear due to miss between 1-6 weeks of action. Romo went down hard on a sack and injured his left (non-throwing) collarbone. Having broken my collarbone in sixth grade, I can predict that he’ll be down for about 6 weeks, and also that he will have a weird bump sticking out of his clavicle for the rest of his life. Cutler, for his part, stumbled attempting a “tackle” after having one of his passes intercepted, and injured his hamstring. While Cutler is far from a “running” quarterback, hamstring injuries can hamper throwing motions and can re-occur if not fully healed. Cutler should only be out about two weeks, and should probably avoid tackling from now on. Stafford was harangued by the Minnesota Vikings front line, and though he stayed in the game, had x-rays taken of his hand and ribs afterwards. His coach described him as “very, very sore”, but Stafford has dealt with injuries like this for a large portion of his career. He rarely misses games, and should be back out against the Denver Broncos in Week 3. Lastly, and perhaps most seriously, Brees took a hard hit to his throwing shoulder, and was demonstrably weaker on long-distance throws throughout the game. The Saints organization are stopping short of saying he might miss time, but it appears likely, in what is already looking like another lost season for head coach Sean Payton and the Saints. I think Odell Beckham Jr. might be a FIFA gamer. Here he is celebrating a touchdown with an homage to soccer superstar Cristiano Ronaldo. If you were still looking for a reason to love Beckham, there’s another one. Also, in case you read this, Odell: I’m ready to throw down in FIFA any time. I am curious to see how the two point play comes into play as we get more of a data set to sample from (i.e. more games). We are seeing some extra points being missed here and there. A couple of two point conversions early on and you can force the other coach’s hand on strategy throughout the rest of the game. Sad to see all the QB injuries. The league has done all they can do to keep these guys on the field but it’s football. And stuff happens.